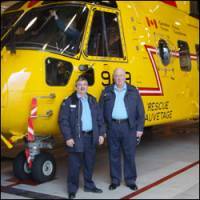 103 Rescue Squadron in Gander, Newfoundland officially retired its three CH-113 Labrador helicopters on November 15 and welcomed three CH-149 Cormorants. The Squadron began flying the Labrador in Gander in 1977, flying more than 35,000 hours, 2500 missions and saving more than 1,500 lives since. The President of CCGA-Newfoundland Winston Pitcher and Chief Executive Officer of the CCGA Harry Strong were both invited to the ceremony.